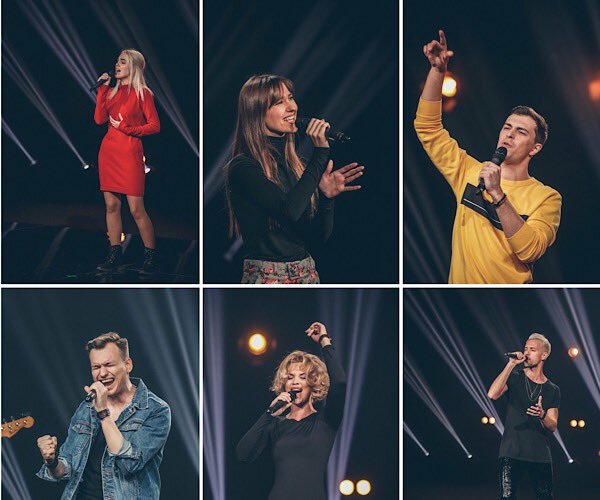 The Latvian broadcaster, LTV, today released the video clips of the auditions that were held in Riga last week. For the first time, we see all 33 shortlisted songs that will be competing for the Supernova crown and the chance to represent Latvia at the Eurovision Song Contest in Tel Aviv in May. It has been revealed that of the 83 submissions for the contest, 64 met the stringent conditions that had been set, and of those, 33 were chosen to advance to the audition round. The broadcaster has released these audition tapes on their YouTube channel and also their website, where viewers can express their thoughts on the songs, giving them a Yes, or a No and a chance to leave some comments! You can find out how to register with your social media logins on this link and then go to “Peoples Jury” at the top of the page. Adriana’s song is written by “My Radiant You” front man Jānis Drīksna and fellow contestant in 2019, Monta Ķimene. It’s an upbeat dance number, and Adriana’s clear vocals shine through. Adriana has recently appeared in The Voice of Lithuania and was a previous finalist on Latvia’s own X Faktor. Markus needs no introduction to Eurovision fans, having competed on 5 previous occasions and hopes to finally represent Latvia with this dance track. We can always rely on Supernova to bring us some of the more avant-gard numbers, and one of this year’s comes from Waterflower, an audio-visual project by artist Sabine Moore. Sabine has been active as Waterflower since 2006 and is currently playing some dates in the UK. Miks is another past Supernova entrant, having competed in 2016 and 2017. His song ‘Life’ has a country feel with a thumping beat behind it. Dzili Violets are a four piece rock band from Riga and their entry is a mix of languages and genres that will surely get people talking! Kristiāna’s self penned songs sees the Jelaga singer lift one of the tracks from her EP “Nejaušības” and it’s a great modern sound, with her vocals really shining through as the dance beat kicks in. Aivo is from Riga, and is a singer songwriter, who has participated Latvia’s X Faktors. This is another uptempo song, there’s certainly a lot of those this year! This is a sweet song, and Roberts doesn’t overdo the vocals. We cannot find anything on Roberts online, however we do have a sneaking suspicion that he is in fact the brother of fellow contestant Monta! Watch this space for future confirmation! On to our second Roberts, and he is another X Faktor alumni. “Feel” has some interesting dubstep beats behind it and Roberts has an amazing voice! Miks Galvanovskis “Fake” – slightly country feel to this song, with some great use of claps and backing vocals! Miks Galvanovskis “Shattered” – in a complete contrast, this is a moody little ballad, which makes great use of Miks raspy vocals. Told you we would get to them! This band are described as a “neo hard rock quartet” although you wouldn’t guess from the beginning of “Awe” although it does give a nod to their roots as the song progresses. We are blessed with bands in this year’s Supernova! Laika upe have a great retro feel, and this entry has some really interesting musical breaks. LIIVA is singer Liva Rudzona from Riga who co wrote this boppy little number, along with Mārtiņš Gailītis from the Double Faced Eels! Ivo has been attempting to represent Latvia in Eurovision since as far back as 2010, and this self-penned entry has some lovely touches which really showcase his voice. Alekss is from Riga, and his entry is written by none other than Aminata (LAT 2015). Aminata also wrote Justs 2016 entry “Heartbeat” and whilst Fireworks doesn’t have the same sparkle as some of her earlier efforts, Alekss certrainly gives it his all! This gives me serious “Lost in Verona” vibes with the male/female duo and the overall feel! Kristīne Šomase is a Riga based singer, but I’m struggling to find details of her male counterpart. Enjoyable 3 minutes! Atis is singer/songwriter Atis Ieviņš from Riga who is also an accomplished guitarist. There is no doubting Atis’ vocal ability, but the song plods along a bit for me. Audiokvartāls are an electro pop/rock band from Riga and their national language song (translation “You Ask Me”) is a cute understated piece of music, confidently performed. Jeļena has appeared in the Voice of Poland, and also Latvia’s X Faktor, but has written her own composition for Supernova. It’s an understated bop, and the girl with many hair colours gives a great audition performance! We all know Samanta from her previous attempts to represent Latvia, culminating in her 2016 appearance where she took herself out of the running in dramatic fashion, telling the public to vote for Justs instead. Samanta does seem to struggle with her English pronunciation sometimes, but this is a dark sassy number and she sells it! One of the favourites from the 2018 selection is back for another go. Edgars performs the hell out of this song which has a great beat behind it, a great little dance number and I fully expect him to make it through to the semi final stage. Elza is an accomplished jazz singer and is part of a group called “Electric Elza”. You can tell her jazz roots during her Supernova entry and it’s finger clicking good. Ēriks has that old school style mix of talking and singing, and has been around for some years with his interesting compositions which include the sounds of motorbikes revving and some classic jazz elements. Written by Eurovision National Final stalwarts, Ylva and Linda Persson, this is Monta’s 2nd solo attempt at Supernova. The feel of the song suits her voice perfectly and this could be one of the favourites to win. Our second five capital letter female singer in a row, Marta Grigale last tried out for Supernova in 2016 and this self written number tells us that she doesn’t want to grow up so she’s going to grow down instead. I really like the chorus, and it’s a cute song. It’s a welcome return for one of my favourites from Supernova 2018 Kris & Oz with their laid back instrumentals and faultless vocals. If you need a 3 minute hug, play this and you won’t be disappointed. Here at ESCBubble we will be keeping a close eye on Supernova and all the other National Finals from around the Eurovision world, so make sure you follow us using the social media buttons below and you’ll get all the news, straight from the Bubble!